Running a kitchen can be dangerous. For one thing, manually changing frying oil results in spillage, which leads to slips and falls. But there’s a smarter way to change your oil. Restaurant Technologies’ Total Oil Management Program handles oil changeover with the flip of a switch. It’s the automated way to reduce risk while ensuring operational quality. Take the first step, with a zero obligation on-site survey today! Why automate and remove outdated risky practices in your kitchen? An automated oil management solution improves physical security by eliminating the need for employees to travel back and forth to the area of the rendering tank to dispose of oil packaging and waste oil. Often, this practice adds unnecessary risk, and leaves the back entrance unsecured as employees haul oil containers and oil to the bins. From an employer's perspective, fewer injuries and security risks translates into better peace of mind that employees are not hurt or victimized, fewer sick days, fewer workman's comp claims, a better overall work environment and improved retention of employees. 60% of workers' compensation incidents in restaurants are related to the handling of cooking oil - whether burns, slips and falls or back strains. The OSHA website is full of examples of severe accidents related to manually handling oil. Especially dangerous is the old-fashioned method of emptying the fryer oil (often still as hot as 300 degrees Fahrenheit) into a stockpot, carrying it across often slippery kitchen floors past many other workers and out into the back dock or parking lot area. Along the way there is potential for spills that lead to serious burns, spills that create a slip hazard and, in addition, going out into a parking lot, often at night, creates a security risk for the employee and the restaurant. In addition carrying two to three 35 lb Jugs in boxes (JIBs) can create back strain risk. Restaurant Technologies closed loop oil management system allows employees to safely and easily dispose of used oil and fill the fryer with new oil at the flip of a switch. No need to ever carry hot oil again. By creating a safer way to manage a risky and frustrating task, employees feel more engaged and satisfied with their jobs. 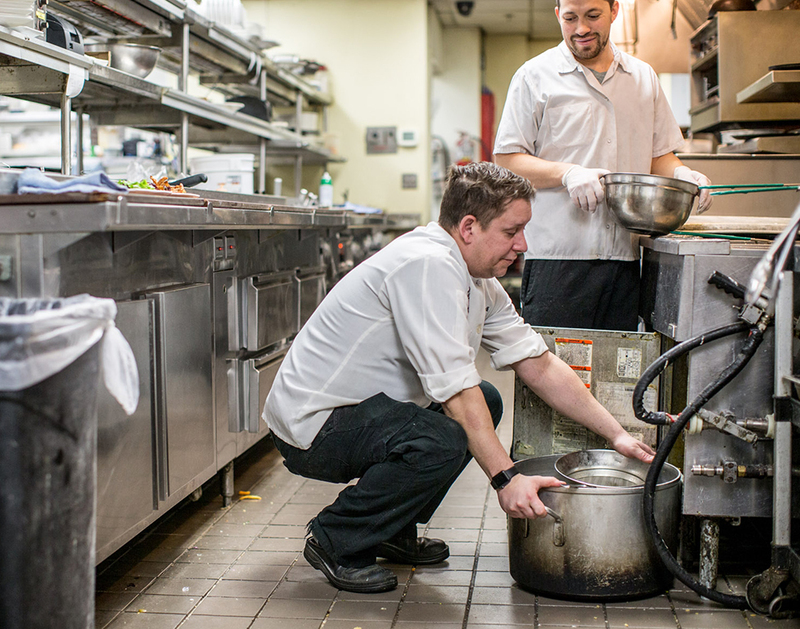 By eliminating one of the most dangerous restaurant kitchen tasks, employees are no longer at risk from oil-related injuries like slips, falls and burns. On top of removing one of the most dangerous if not the most dangerous element of risk from your restaurants kitchen, when you implement our Total Oil Management system you are improving your kitchens accessibility to comply proactively with the requirements of the Americans with Disabilities Act or ADA. By making reasonable accommodations to your restaurant equipment fryer work station. You are expanding your facilities workforce opportunities to provide equal opportunities to persons with disabilities, elderly employees, or persons with physical limitations who otherwise would have required assistance or did not meet the requirements to lift or carry heavy, hot, used oil.